In The Lotus Sutra, the practice of Buddhism is presented as an opening of the mind to truth formerly unknown. As the individual is instructed by the Buddha’s teachings, he gains a higher perspective on life. Early in the text, the Buddha praises his own learning to the listening Shariputra, explaining that what he has mastered is the “rarest and most-difficult-to-understand law. The true entity of all phenomena can only be understood and shared between Buddhas” (The Lotus Sutra 24 or see chapters 2 and 3 in the Kern translation). The knowledge which those hoping to achieve enlightenment seek after, then, can only be fully understood when one has become a Buddha. The point is not for the follower of Buddha to grasp his teachings in one’s current condition of ignorance. Instead, one is to merely listen to such teachings in awe, awaiting the time when one may comprehend them. One must wonder, though, how one can open one’s mind to a truth that one cannot understand. One cannot be sure one has opened one’s mind to the correct truth if one is not certain what this truth is. In dialogue with Shariputra, the Buddha refuses to clarify what his teachings are, as he argues that those who have been following after his ways will become doubtful, and those who are arrogant “will fall into a great pit“ (TLS 29). The implication in these speeches is that those who think they already know something do not, and that, when confronted with the Buddha’s true teachings, they will fall away. The followers the Buddha would count most faithful, then, are those who do not claim great knowledge, but are rather trustingly following the Buddha. It is these followers whom the Buddha attempts to address. The Buddha’s method of teaching is by way of expedient, or skillful, means (TLS 27). There are three main expedient means: the signs which show he is an auspicious portent for the Bodhisattvas such as when the beam of light is emitted from the Buddha’s head (TLS 21), the use of metaphors, and the preaching of the law. At other points in the dialogue, however, the Buddha confesses that he and other teachers use countless means to explain the teaching. These include expressing teachings through causes, conditions, similes, and metaphors (TLS 31). These means are usually defined as methods, but in other texts written in early Sanskrit they had the connotation of being “tricks” (Pye 12). When one “tricks” another person, one makes things appear one way when the reality is quite different. Therefore, the Buddha uses persuasive speech, employing various rhetorical techniques, in order to convince his listener of the truth in what he is speaking, though what he says is false. Each of these means, however, must in some way connect to the single vehicle which the Buddha preaches (TLS 31). Since this single vehicle, or message, is intended to lead listeners toward Buddhahood, it is preached, “as though it were three” (TLS 32). It must be preached in this way so that it will address the various ways in which persons are defiled in an impure age. The expedient means, then, are only tools to convey the message in a way that will be accessible to persons of various types of ignorance. One of the expedient means which the Buddha presents is the use of parables. Early in the text, he tells a tale of a rich man who has a house filled with a horrendous assortment of evil things. Within are found demons, violent animals and wicked people (TLS 66). While the man is out, his house catches fire and he returns to find that his sons are still trapped inside. His sons, meanwhile, are playing a game and refuse to follow him out of the burning house. The rich man employs an expedient means which is a trick to get them out of the house: he tells them that he has ornate carriages of various kinds as toys. (TLS 67). After the sons are safely out of the house, he only has one kind of carriage for all of them. The Buddha explains the meaning of this parable, himself being the father. The sons are those he is preaching to who are still without understanding. The house which catches fire is the threefold world full of suffering. 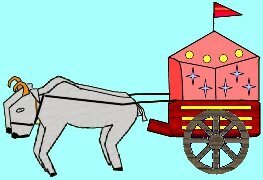 The three carriages used in the tale are an example of why the Buddha must use expedient means. He finds those in the material world to be so far removed from the truth that they will not listen to it. Therefore, he presents them with something that appeals to their immature mindsets, which will prepare them for the real truth. This calls to mind the use of expedient means as a trick. The trick is justified in that the Buddha will eventually lead one to the truth, but has to use fanciful ideas in order to achieve his purpose. There is an underlying assumption that those who have been rescued using expedient means will then be open to learning this higher truth. The value is placed, then, not on the truthfulness, but rather on the efficiency and results of the Buddha’s teachings. Thus the Buddha uses expedient means as a way to entice his audience. The expedient means do not, in and of themselves, offer any truth. They are a distraction technique to draw the attention of a crowd from the suffering of their daily lives, to which they have been blinded. The Buddha can then reveal the true vehicle to these followers. Just as a magician or performer may draw one’s eye by presenting something visually appealing, so the Buddha offers something pleasant to listen to. Pye, Michael. Skilful Means: A Concept in Mahayana Buddhism. 2nd Ed. London: Routledge, 2003. The Lotus Sutra. Trans. Burton Watson. New York: Colombia University Press, 1993.